The Motor-Sizes TM280-05 and TM280-10 have been obsoleted due to lack of demand ! The TM280 Mini Series covers the low and medium power range of the Torcman products. They can be used for all applications which require 250 bis 400 Watts of electrical power. With the available 3 stator lengths (15, 20 and 30mm) an the choice between 10pole and 14pole rotors (TM280-30 only 14pole), they can be matched to nearly all applications. 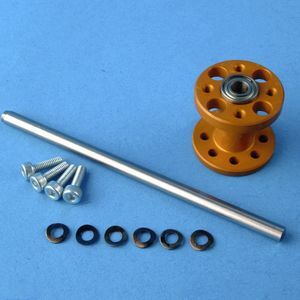 The 10pole versions are intended to be used for applications which require high revs between 8000 - 30000 U/min), for example in small, fast models (Twinjet ...), small model helicopters or racing boats. The 14pole versions are better for lower revs (4500 - 10000 U/min.) with more torque and can be used with props up to 14" props. They can be used highly efficient in sail planes, small hotliners and small acro flyers. 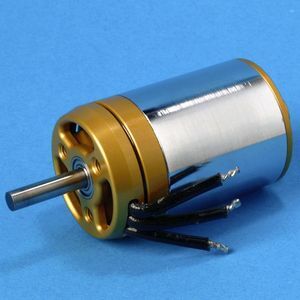 Due to their small dimensions (~34mm outside diameter), these motors fit without problems into most model fuselages. If it's getting really tight, the motor can be moved 20mm to the rear with the available extension kit (see below). All motors can be supplied (or converted) for inside fuselage (behind front wall) or outside fuselage (in front of fuselage) mounting - please add a remark when ordering for rear mounting (the shaft exits to the opposite side). The TM280 "Triton" has been specifically developped for integration into very tight fuselages as usual in High Tech Competition Gliders and Hotliners. By implementing a third bearing, the rotor is additionally supported on the front to avoid mechanical vibration and make the complete motor more robust against forces from outside. Big air inlets in the frontshield allow efficient cooling and is easier to install in narrow fuselages because of its conical shape. 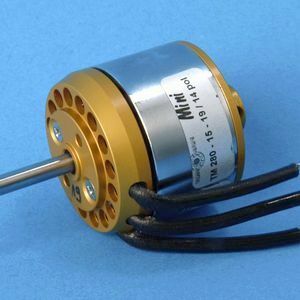 The motor can be used upto 750Watts in short time applications (<30sec.). Recommended max. prop diameter is 15" . Examples for applications can be found on the main page under "Fascination - Practic Samples". 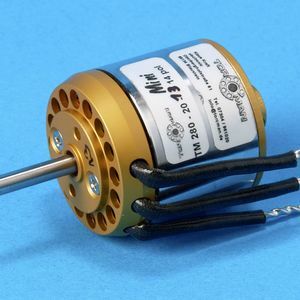 In combination with High Power Lipo cells, these motors form a very light and effective drive set. TM280-20: models up to 2,5Kg, Hotliner up to 1,4Kg with 10 cells or 3 Lipos , 250 - 400Watts. TM280-30 Triton : High Perf Gliders upto 3.5Kg with 10 - 14 cells or 3-4 Lipos , 500 - 750Watts. Torcman motors are optimized for use as direct drive engines - gears are no longer required for use with big props. Upon Request you will receive a precise offer for an optimized setup which fits your application - please fill out the Consulting Form and send it back to us. Typical setups with battery cells and props can be found on the main page under "Configuration" or in our Practic Samples .